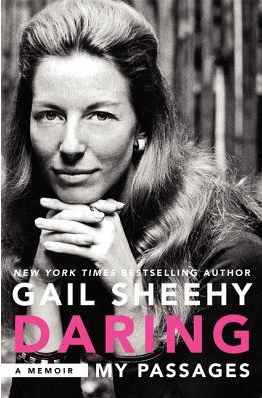 Synopsis of Daring: My Passages by Gail Sheehy: The author of the classic New York Times bestseller Passages returns with her inspiring memoir—a chronicle of her trials and triumphs as a groundbreaking “girl” journalist in the 1960s, to iconic guide for women and men seeking to have it all, to one of the premier political profilers of modern times. Candid, insightful, and powerful, Daring: My Passages is the story of the unconventional life of a writer who dared . . . to walk New York City streets with hookers and pimps to expose violent prostitution; to march with civil rights protesters in Northern Ireland as British paratroopers opened fire; to seek out Egypt’s president Anwar Sadat when he was targeted for death after making peace with Israel. Always on the cutting edge of social issues, Gail Sheehy reveals the obstacles and opportunities encountered when she dared to blaze a trail in a “man’s world.” Daring is also a beguiling love story of Sheehy’s tempestuous romance with and eventual happy marriage to Clay Felker, the charismatic creator of New York magazine. As well, Sheehy recounts her audacious pursuit and intimate portraits of many twentieth-century leaders, including Hillary Clinton, Presidents George H. W. and George W. Bush, and the world-altering attraction between Margaret Thatcher and Mikhail Gorbachev. Sheehy reflects on desire, ambition, and wanting it all—career, love, children, friends, social significance—and lays bare her major life passages: false starts and surprise successes, the shock of failures and inner crises; betrayal in a first marriage; life as a single mother; flings of an ardent, liberated young woman; her adoption of a second daughter from a refugee camp; marriage to the love of her life and their ensuing years of happiness, even in the shadow of illness. Now stronger than ever, Sheehy speaks from hard-won experience to today’s young women. Her fascinating, no-holds-barred story is a testament to guts, resilience, smarts, and daring, and offers a bold perspective on all of life’s passages. I started reading this around the time that Harry Potter's Emma Watson spoke about gender equality at the UN Assembly as its ambassador for women, with a speech that blows the conversation wide open on just how loaded the term "feminist" is ... to this day! The fact that Gail Sheehy is among those women who made a difference in this movement really shows how far we have gotten, and how far we still have yet to go. I have to admit that I didn't know who Gail Sheehy is before hearing about this book. But upon reading the synopsis and her short author bio, I wanted to know more! This memoir-autobiography tromps through Gail's private and professional lives, both of which are generously sprinkled with interesting people, travels throughout the world, and challenges that a woman of less daring or courage would probably shirk at. Gail is a pioneer of a woman who has become quite the advocate for feminism even before the term "feminist" was coined. She is among the first women journalists (along with contemporaries such as Gloria Steinem) who broke into the male-dominated hard news clique, breaking ground with New Journalism covering civil rights issues and exposing women's issues in health, prostitution, and the female psychology in the family and society in general. She later became renowned for her probing yet personable profile of movers and shakers like Hilary Clinton and Margaret Thatcher, among others. She also penned a groundbreaking work entitled Passages which puts a spotlight on women's life stages (during a time when all that was written about was men!). Although I am unfamiliar with the work, based on what I am picking up on the interwebs this is a much-beloved work that resonated with many women during the 1970s. This book is more than one women's memoir: it's bigger than that! Gail has lived through key historical moments in America: the cusp of the feminist movement, living through it, contributing to it, and still an advocate until today. For all her accomplishments in journalism, I loved how Gail lets us into her personal head space as a mother, wife, lover, colleague and friend, tracing her entire life "passages." It makes for touching reading and is a reminder that well-known personalities are living their own private battles too. Peek into her life through her photos scattered throughout the book. Warning! This is a chunkster of a book (close to 500 pages!) and when the book was late getting to me, I honestly balked at the idea of getting through it in a week and having to write a review. But the writing is easy and conversational, funny and warm—Gail's voice is clear, strong, accessible and I fairly breezed through this. 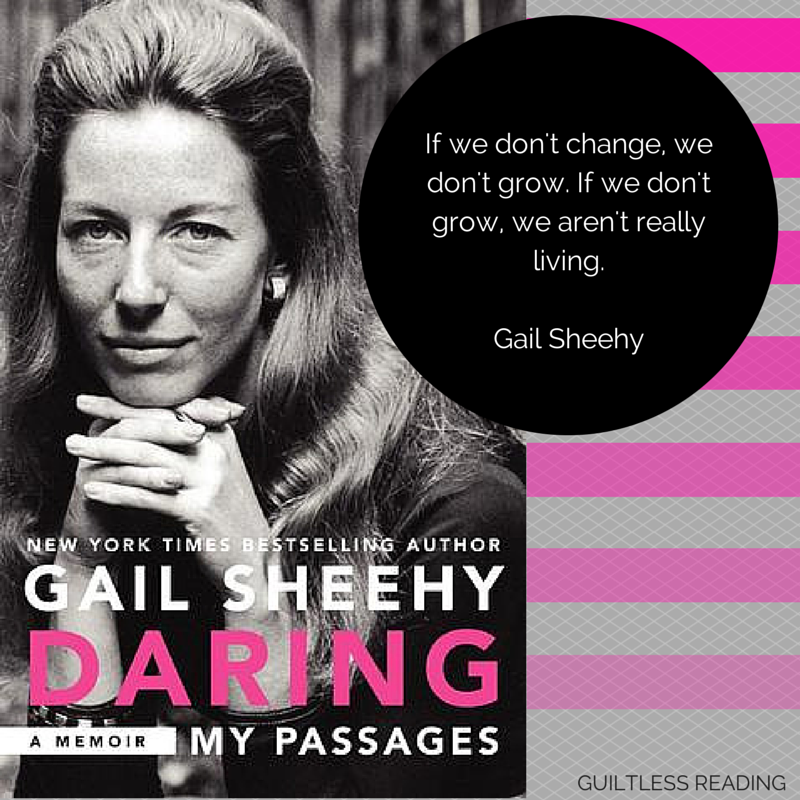 Verdict: I really enjoyed reading this memoir and am thankful that Gail Sheehy has taken the time to document her fascinating journey as a woman and journalist through the past fifty years. A feminist advocate whose body of work all women today are indebted to, I recommend this memoir to anyone interested in the feminist movement in the US, New Journalism, or has an interest in the life stories of inspiring women. Connect with her through her website, Facebook, and Twitter. I received a copy of this book from the publisher via TLC Book Tours in order to participate in this tour. Don't forget to check out the rest of the tour here. I hadn't heard of Gail before this tour but clearly I'm missing out on an amazing woman! I'll be reading this book for sure.